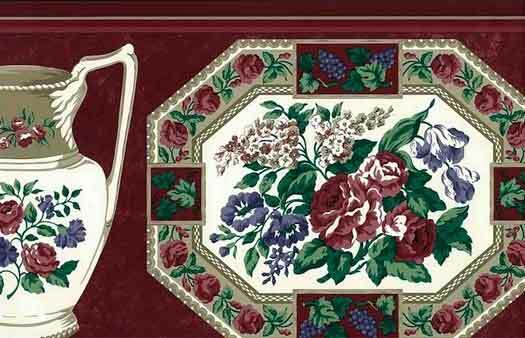 Plate pitcher vintage wallpaper border by Waverly with Cranberry Red and Purple peony-like flowers. Green stems on an Off-White background. The platter has White/Red anemone-like flowers, trailing Green ivy and Purple grapes. The background is faux finish Cranberry Red with broad bands of Cranberry accents with narrow bands in Taupe and Rose at the top and bottom edge. The height of this border–12.25 inches–enhances the overall WOW effect.